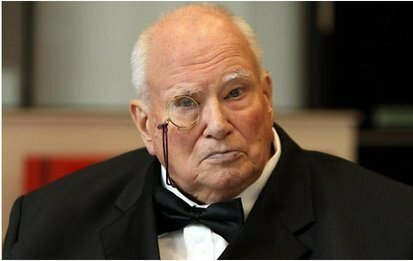 Patrick Moore was one of the best known astronomers to the general public, largely through his television programme which ran under his preparation and presentation every month for 55 years up until his death, during which time he missed only one episode. His instantly recognisable appearance and manner could not disguise his enormous enthusiasm for the subject, nor did it disguise an extremely wide gamut of knowledge; generations of astronomers attested that these qualities inspired or encouraged them to embark on careers in the area. No less was his great generosity of spirit, which often manifested itself as generosity in more material ways. His connection with Ulster began in the 1950s when the energetic and stimulating Moore visited the province to give lectures and presentations at Armagh Observatory, the oldest establishment of its kind in Ulster, dating as it does to 1790 (and very much still in operation) and only the second in Ireland. In the 1960s it was decided to build a planetarium to complement the Observatory. The Director was Dr Eric Mervyn Lindsay, who had campaigned for many years for funding from local councils and the Northern Ireland government. The 1960s were a largely positive decade in Northern Ireland: it was a period of economic expansion and a kind of calm before the storm which would break at the end of the decade; the Prime Minister, Terence O’Neill, was a generation younger than his predecessors and seemed to want to take the province forward. The chief architect chosen for the planetarium project used as a model the Queen Elizabeth Planetarium in Edmonton, Canada. Work commenced in 1965. Moore was appointed Director that year in succession to Lindsay, and with his characteristic knowledge and energy supervised the whole project thoroughly, overseeing the construction of the dome, the selection of projectors, everything to be state of the art, as it was. The Armagh Planetarium was opened on 1 May 1968 by Prime Minister O’Neill. Moore had submitted his resignation to be effective from that precise date, his job done. In his three years in Armagh he presided over a construction with the best equipment and presentations, what a planetarium is really there to do. The Planetarium was an immediate success, soon attracting some 50,000 visitors per year and winning tourist board awards for this. There is little doubt that much of this was due to Moore’s careful and expert guiding hand during design and construction. Moore installed himself in a fine Georgian terrace house in the centre of Armagh city, and dispensed a lot of hospitality, especially if it concerned astronomy, though his interests were wide and included music (he was a keen xylophone player) and cricket (his house overlooked a cricket square on The Mall, Armagh). He initially showed an interest in youth organisations but he never understood, and certainly did not like, the social segregation in Ulster based directly on religion. He even declined to keep up his membership of the cricket club when he was asked his religion (he had none in any case). Meanwhile he continued giving his lectures and talks, which were always very popular; as a prolific writer he had some 100 titles to his name over his career; and of course there was his celebrated and popular television programme, The Sky at Night, which he not only presented but also wrote (so fluent was he that he never used autocues or similar aid, just prompt cards). This programme was first broadcast in April 1957 and is said to be the longest-running, continuously broadcast television programme ever, apart from news programmes, though these latter often change formats whereas Moore’s never did, so that his achievement may be even more impressive. He was interested in just about every aspect of astronomy, but his principal interest insofar as he had one concerned the Moon. Such was his knowledge about the Moon that he decided, using his own 15-inch reflector telescope in his own back garden, to make maps of the lunar surface (or that part visible from Earth). These were of such high quality that in 1959, when the USSR sent an unmanned probe, Lunik 3, to the Moon, they made use of them. He later was consulted by NASA when they were planning their own lunar exploration. It happened that the last Sky at Night he made was indeed about the latest research on the Moon. His longevity can be illustrated by his having met Orville Wright, the first man to fly in a heavier-than-air aircraft, and also Neil Armstrong, the first man on the Moon, whom he interviewed for his programme. Moore was appointed OBE in 1968, CBE in 1988 and knighted in 2001. In 1982 a planet was named after him by the International Astronomical Union. He also held the post of President of the British Astronomical Association in addition to the Directorship at Armagh. The Royal Society elected him to an honorary Fellowship (though curiously never a full one). He never married, his fiancée having been killed in an air raid during the Second World War. The Armagh Planetarium still flourishes, Patrick Moore’s enduring legacy in Ulster.